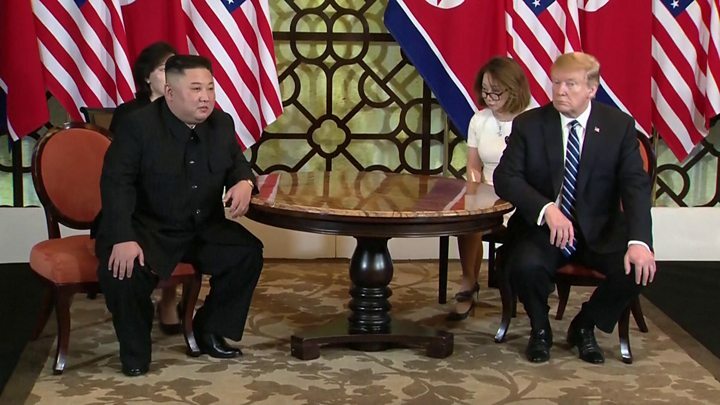 US President Donald Trump and North Korea’s leader Kim Jong-un have begun a crucial final day of talks in Vietnam on nuclear disarmament. Little progress has been made towards denuclearisation since a first historic summit last year. All eyes are on what if any concrete steps will be agreed. “There’s no rush. We want to do the right deal,” Mr Trump said alongside Mr Kim ahead of their meeting. Mr Kim said he had a feeling that “good results” would be reached. They are expected to discuss a roadmap for removing nuclear weapons from the Korean peninsula and could also announce a formal treaty ending the Korean War or even liaison offices. The first summit last June in Singapore between two leaders who had previously only exchanged vitriol was certainly a historic moment. Now, they are both very conscious of the need to answer their critics with signs of concrete progress. Washington had previously said North Korea had to unilaterally give up its nuclear weapons before there could be any sanctions relief, but that condition is known to be a sticking point for the North Koreans. The US president said he had “great respect” for Mr Kim and that their relationship was “very strong”. He said people seeing him alongside Mr Trump would think they were watching a “fantasy movie”. At the end of 2017, when they were both threatening each other with war, Mr Trump called Mr Kim “little rocket man”, and Mr Kim said Mr Trump was a “mentally deranged dotard”. How will the day of talks unfold? The leaders will hold a series of meetings at the Metropole hotel in the Vietnamese capital, Hanoi. They emerged from their first session after about 30 minutes and took a brief stroll in the courtyard. It was initially said the meeting would last 45 minutes. They were joined by their chief advisers – Kim Yong Chol for Mr Kim and Secretary of State Mike Pompeo – and interpreters. A “joint agreement signing ceremony” will be held at the end of the meetings and Mr Trump is scheduled to give a news conference at 15:50 local time (08:50 GMT). It is not clear what the joint agreement will include although there have been working level talks between North Korea and the US in recent weeks. The tone of the talks was set in a dinner on Wednesday when Mr Trump described Mr Kim as a “great leader” and said he looked forward to helping him achieve a “tremendous” economic future for North Korea. Mr Kim called the US president “courageous” in return and said he was confident there would be an “excellent outcome that everyone welcomes”. One notable absence from the negotiating table is the question of human rights in North Korea, also ignored in Singapore. What do we know about North Korean reaction? North Korean state media have praised Mr Kim for making the 4,000km (2,500-mile) trip, with state paper Rodong Sinmun dedicating four out of its six pages to it. It said North Koreans had reacted to his visit with “boundless excitement and emotion”, and urged people to work harder to “give him reports of victory when he returns”. The paper also added that his overseas trip had caused some of its citizens sleepless nights, with one woman telling a state broadcaster that she “really missed” Mr Kim. What might Kim learn from hosts Vietnam?